On December 10 Islington council’s planning committee approved the council’s plans to build a modest number of new homes in the area between Hathersage Court and Besant Courts (on the site of the disused football court and sunken playground) behind Besant Court and on the corner of Mildmay Park and Newington Green (in place of the temporary prefab currently occupied by the dentist), along with extensive improvements to the public realm on both estates. Following a long process of consultation, with several iterations of the plans with a number of changes and adaptations, The Hathersage Court TRA gave its conditional support for the planning application. That planning application has now been approved unanimously by the council’s planning committee. Throughout the lengthy process of consultation and engagement with that the council has undertaken with the community on the estates, the TRA has maintained a consistent position that while it is not opposed to redevelopment per se, the development proposed must be appropriate to the site. For the TRA, this has meant that the quality, massing and scale of the proposed buildings must fit the context and – most importantly – that the council adopt an estate-wide ‘holistic’ approach to the redevelopment, treating the two estates as a whole and bringing forward plans to improve the whole of the estates, including existing buildings. For the TRA this is an imperative that must be met. After a number of iterations of the development plans over several years, some of which were inappropriate, the TRA has been impressed with how the council has listened and adapted its plans in response to residents’ feedback and this is to be commended. We are now of the view that the current proposals, overall, are on balance positive, and if realised in the form represented in the planning application could become a very good example of sensitive estate renewal/infill. The TRA therefore supports the plans. In particular, residents were very pleased that overall development now includes block improvements to Hathersage Court and a softening of the landscape at the front of the block, facing onto Newington Green. The proposals to improve the appearance of the front of the estate are very welcome, particularly the plans for a new entrance and bin storage area and a new building on the Newington Green Road corner for bike storage. The landscaping plans are also welcome – rationalising the car parking and adding new landscaping and planting, including a hedge will dramatically improve the front of the block. We also view the plans to improve the appearance of the block itself favourably – removing the blue steel security fencing from the block and other clutter on the building, as well as repainting the walls on the walkways and the lift shaft running up the middle of the building in a light grey, as presented to residents in the final consultation, will be a big improvement. We would impress upon the council the importance of these improvements being delivered as part of the overall development. Overall, we support the proposals and after waiting for more than 6 years for the plans to get to this stage we are keen for the council to now press ahead. In terms of the proposed development, the designs have been developed and improved in consultation with residents and have reached a point where they have struck a very good balance between the many competing priorities, and, importantly, will deliver much needed new homes. We are very supportive of the landscape improvements as well as the proposed play areas, which are very positive and well designed. We want to see these delivered as set out in the plans. Hathersage and Besant Courts have remained in disrepair and disuse. Back in 2010 the TRA was seeking support from the council to bring these play areas back into use, but we were told that funding was not available and that the council was instead looking to develop homes on the area. While that process has taken place the football courts have remained out of bounds and the play area has been poorly maintained and is unfortunately underused as a result. Should the planned development, with the new proposed play areas, be delayed further this situation will continue. This is unacceptable and in that case we will call on the council to invest in the playground and football courts. The TRA notes opposition to the plans from the Newington Green Action Group, particularly to Block K, which they say does not conform to the Newington Green Conservation Area Statement. The TRA disagrees with this objection. Block K is a 4-5 storey building that will stand next to Hathersage Court which is 6/7 storeys. In our view Block K provides a visual link between the architecture of Hathersage Court and the more traditional terrace homes on Mildmay Park. The design also provides for a visual integration of the two buildings. Commercial uses on the ground floor are appropriate, and directly replace the existing commercial uses. As a point of principle, the TRA fundamentally disagrees with a key element of the Newington Green Conservation Area Statement, which highlights Hathersage Court as a ‘negative feature’. In our view this is an expression of prejudice against post war architecture, in favour of the earlier forms of traditional architecture (Victorian, Georgian etc). While The Newington Green Action Group may wish Hathersage Court away, preferring it knocked down and replaced with terraces designed in a historical style, the fact is that this would lead to a significant lose of housing –and in particular social housing. Hathersage Court was built in the 1960s and whatever your subjective view on the merits of it as a piece of architecture, it is now part of Newington Green’s history and is home to a mixed community. Block K provides for a contemporary link between two established buildings within the conservation area – Hathersage Court and the terraces on Mildmay Park. It is in keeping with the scale of Hathersage Court (indeed it is smaller) and is also in keeping with the heights of other buildings around Newington Green, including the China Inland Mission and the apartment block at the intersection of Green Lanes, Newington Green and Albion Road (Holland House, 11 Albion Road). For these reasons we support the plans for what has been a carefully put together development plan that will, on the whole, have a hugely positive impact on Hathersage and Besant Courts and allows for the delivery of a significant number of new homes. As part of the plans the TRA has been lobbying the council for improvements to Hathersage Court, particularly to the front of the estate as it faces onto Newington Green, with new landscaping and a new area for the bins. These plans will greatly improve the appearance of the estate for residents. We are awaiting further feedback from the council and will update again soon. There will be a Bi-Annual General meeting of the TRA taking place on Thursday 9th February at 6:30pm in the Midlmay Community Centre, Mayville Estate, Mildmay Road. All welcome!! Please come and share your views on the council’s plans to redevelop the estate, including building new homes, redesigning the front (Newington Green side) of Hathersage Court and potentially creating a commercial development. We also need to fill the following positions on the committee: Chair, Treasurer, Secretary. The workload is not onerous (essentially limited to helping organise a few meetings a year) and is accessible to anyone who lives on the estate. FIVE new buildings will be built – two of the buildings will be SEVEN stories tall, ruining residents views. Residents will lose the car parking between Hathersage and Besant. The council wants to create a public square and a public pathway through the estate. Hathersage Court and big Besant will have NO improvements at all. WHERE: Mildmay Community Centre, Mayville Estate, Mildmay Road. Following the meeting last autumn, Islington Council have now revised their proposals for redeveloping the estate, which they presented to tenants and residents during a drop-in consultation held at the Mildmay Club at the beginning of May. As a follow-up to this, the Tenants and Residents Association organised a meeting for people living on both Besant Court and Hathersage Court to come together and discuss what they thought to present a unified response to the councils’ proposals. First, what is proposed? The sunken playground was out of commission for a long time due to an apparent threat from the roots of the trees towards the wall of the football pitch. This resulted in the entire playground being shut, and part of the car park fenced off. Over the last year, the TRA has got the playground re-opened (although the football pitch is still out of bounds), and the fences have been pushed back by local people and the space being used. The council is now proposing that they build new developments in the playground/football pitch and car park areas – and also that they demolish little Besant and replace that with several new blocks. Architect’s model of Hathersage and Besant Court Estate following new build developments. 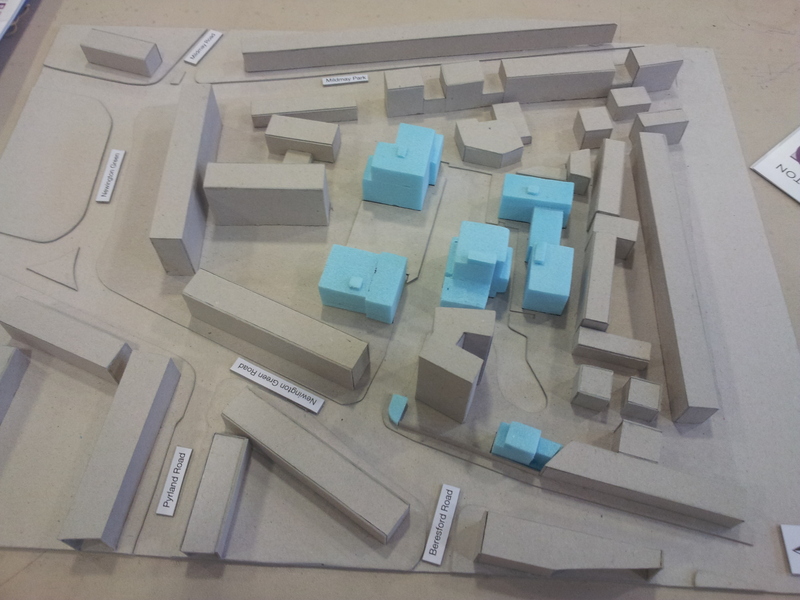 The attached photograph shows a model of how the proposed new buildings would fit into the estate grounds. The tallest new buildings (all in blue) are 7 storeys high – the same height as Hathersage Court, and substantially taller than little Besant. The shortest are 3 or 4 storeys. The plan also calls for the Mildmay Road exit to be reopened – thus allowing for the estate to be crossed from one side to the other. The residents all objected to the councils proposals in their present format. A list of perceived problems was constructed. The residents agreed that the TRA should represent residents of both Hathersage and Besant Courts. The Committee were requested to write to Islington Council objecting to the development in its current form and requesting improved communication with and involvement of residents. Residents were encouraged to individually contact the council and give feedback on the proposals by the deadline of Friday, 24th June. The Tenants and Residents Association held a meeting on Tuesday 6th October which was extremely well attended by residents of the combined Hathersage and Besant Court estate. The primary objective of the meeting was to discuss potential improvements to the Estate, including the possibility of new-build housing. This was introduced in a presentation by Rosemarie Jenkins, Housing Development Project Manager from Islington Housing and Adult Social Services department. The meeting was also attended by Councillors Joe Calouri and Jenny Kay. Full minutes from the meeting will be posted online shortly. Note: further updates from the Council are expected by January 2016, and not November 2015 (as indicated in the September briefing). Any information – whether current or historic – held by Islington council pertaining to plans for redevelopment/new build development on Hathersage Court and/or Besant Court in Mildmay/Newington Green. This should include any reports, plans, feasibility studies, letters, meeting minutes – or any other information held by the council that pertains to the potential redevelopment/new build development on Hathersage Court and/or Besant Court. Please note: This should include any information about proposals for redevelopment/new build development on Hathersage Court and/or Besant Court that were developed by Homes for Islington. The time period for this request is for information held by the council dating from January 1 2010 to the present (the date the request is processed by the council).